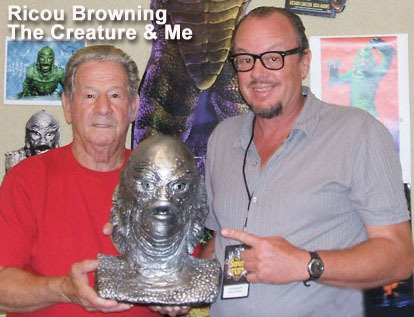 The Creature From The Black Lagoon, cast from the Original Water Creature worn by Ricou Browning in 1954. Clawing Monster from a Lost Age Strikes From the Amazon's Forbidden Depths! 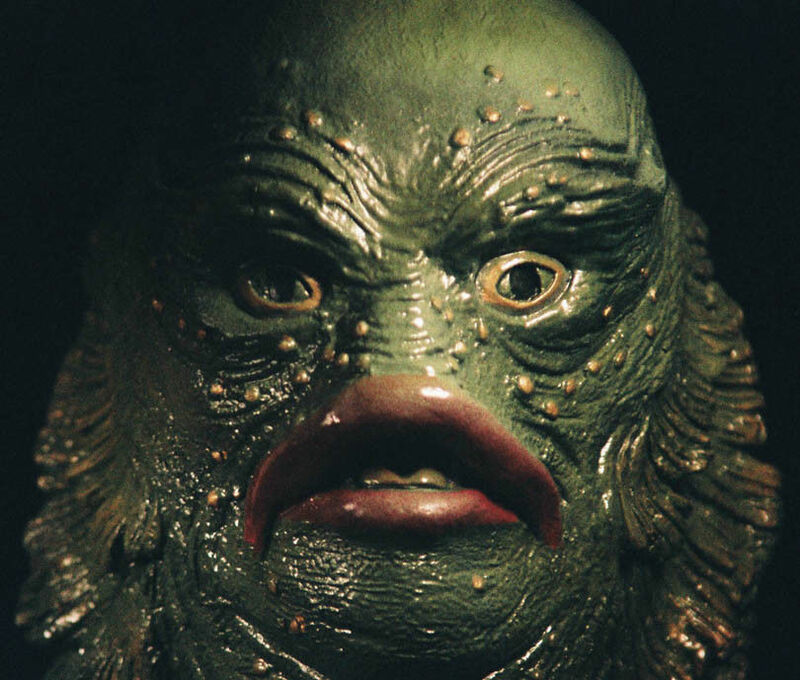 I Love the Creature, he is one of my favorites. For years now customers have been asking me to do a Creature. I would tell them the Creature is done what could I add. It is not like where I take Karloffs face and build up the makeup to recreate the Frankenstein Monster I could not use my Sculpting skills to add anything. BOY WAS I WRONG!! I got the cast of the Water creature and found it very cool at first but noticed it was collapsed and in some areas the detail was completely missing because the rubber had shrunk and Rotted. I first had to restore the size and shape of the head while preserving the all authentic skin detail. After succeding with this I recreated the missing detail from studio stills. The Original Makeup was supervised by Bud Westmore. I then added the mouth and eye detail seen on the land Creature makeup. The result is a Creature that LIVES. The total package! I am very glad I did it and very proud of it. I hope you enjoy it as well. I am a fan and do what I do with love that you can see in the final work of art. 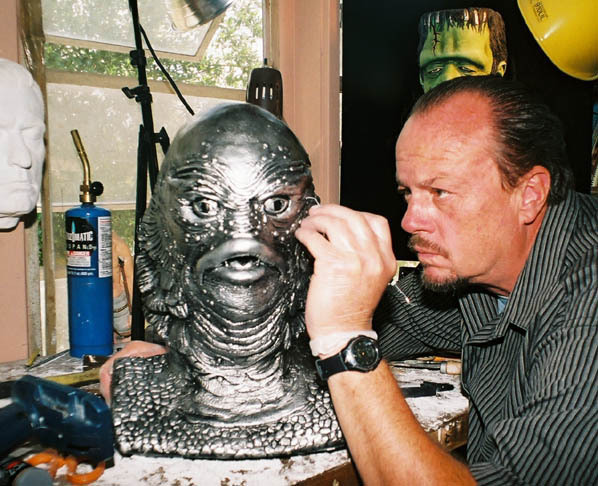 I watched the Creature from the Black Lagoon while I sculpted to further infuse the spirit of the Creature. I do this everytime I sculpt to really live it. The finished piece is cast in USG's Tuf-Cal gypsum cement, it is fiber filled and has polymer additves to assure it will last forever. The piece is life size. It measures 15" High X 11.75" Wide X 8" Deep. This version is FLAT on the back for wall hanging, and it is flat on the bottom so it can stand freely. It is aproximatly 15 pounds unpacked. 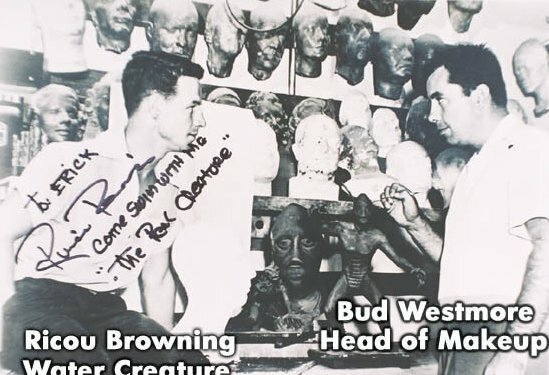 It is finished in full color from the descriptions of the 2 actors that wore the suit Ricou Browning told me about it personally and Ben Chapman told my friend Steve the Creature nut about it. This is important since no real color shots were taken. Even the gold highlights are here, they were used to create iridescent highlights for the black and white photography. The piece is then sealed with a clear coat to preserve the finish and give him a slimey look. Each Head comes with hanging instructions and the screw. This mask is one of a LIMITED EDITION signed and numbered by me Erick Erickson the artist. As a Bonus your purchase comes with a signed and numbered CERTIFICATE OF AUTHENTICITY.